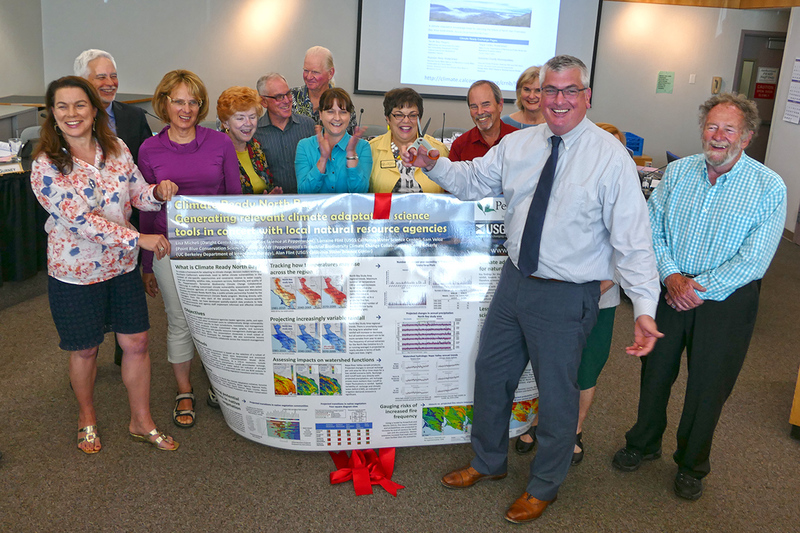 Pepperwood and the Sonoma County Regional Climate Protection Authority are excited to announce the deployment of Climate Ready North Bay, a flagship platform to empower our community to confront the natural resource challenges presented by climate change. Climate Ready looks at critical factors impacting local resources—including water supply, forest health, and wildfire risks—and shows how they are projected to shift over the coming decades, with site-specific assessments developed for the individual needs of resource management agencies in Sonoma, Marin and Napa counties. It is bridging the gap between researchers who produce applied climate science and the managers who need it on the ground. Climate Ready makes this localized climate modeling practical and actionable by collaborating with the agencies it serves to create customized data products specific to their needs. For example, staff from Sonoma County’s Region Parks and the Open Space District helped identify and analyze 28 parcels they manage, and are interested in using project results to frame long-term climate smart land acquisition strategies and stewardship management plans. “This is not just a big wad of data being made available. We worked directly with local agency staff to customize results for direct application to water planning, conservation investments, and land use assessments, at a scale relevant to local decisions” shared Dr. Lisa Micheli, Pepperwood’s President and project manager for Climate Ready. The limitation of global climate models is that they contain only one “pixel” of data for all of Northern California, and are woefully inadequate at providing insights into how climate change will play out over the tremendous diversity of Bay Area ecosystems and microclimates. Climate Ready pulls together a knowledgebase of more than 5 years of research by Pepperwood’s Terrestrial Biodiversity Climate Change Collaborative (TBC3)—a team of 20+ scientists across a range disciplines—that effectively “downscales” global data projections, creating a detailed data set at the scale of 18-acre pixels. As a result of this work, there are now over a million pixels of data for the Bay Area alone, meaning our natural resource managers have what may be the best historical and projected climate-water-forest knowledgebase in the nation. “This is the outcome of more than five years of coordinated research projects at Pepperwood. We are lucky to have Pepperwood, an organization locally that can handle the new reality of BIG DATA, so that we don’t just accumulate 24 terabytes of data onto a server – but we translate it into dynamic tools for land and water managers. This is the beginning of resources management 2.0,” said Sonoma County Supervisor James Gore. In addition to informing Sonoma County’s Regional Climate Protection Authority’s Climate Action 2020 Plan, applications include: a climate adaptation plan for Sonoma County Water Agency; a 40-year water management assessment by Marin Municipal Water District; development of land acquisition and stewardship strategies by Sonoma’s park and open space districts; and groundwater management in Sonoma and Napa counties now required by new California groundwater legislation. Pepperwood’s TBC3 will be providing ongoing support to resource managers as they incorporate report findings into their planning. Funded through the California Coastal Conservancy and participating agencies, the Climate Ready North Bay project is the culmination of a private-public partnership that could serve as a national model for future work under the White House’s Climate Resilience Tool Kit. Click here to visit the Climate Ready North Bay Exchange Pages where you can learn more about the project and view the resources produced. Pepperwood’s 3,200 acre scientific preserve is now home to over 70 ongoing research projects generating insights into the health of Northern California’s plant and animal life and how they are responding to the pressures of a changing climate. Pepperwood also hosts an innovative citizen science initiative that empowers the community to participate in onsite research, and offers environmental education opportunities for all ages.